Bengalis across Arakan State are minorities and 29% were they. 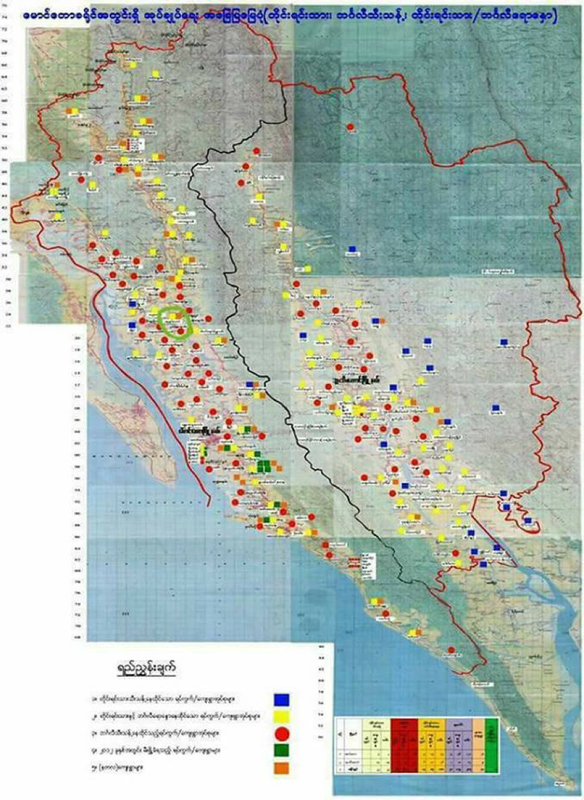 According to the map, they are minority in southern Arakan State, but they are majority in two northern suburbs, forming 9 5%, even in Sittwe their numbers are not much difference with Rakhines. According to British census in 1872, there were 58255 Mahomadens and in 1901 it increased to 154887. Looking back at all ages Census in Buthidaung and Maungdaw area, the population growth rate of Bengali is found to be much higher than that of Rakhines'. This is anxiety-causing factor that Rohingya will swallow Rakhines in terms of Population. 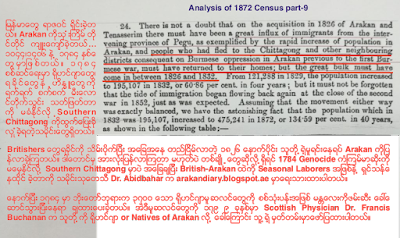 In addition, if we look British-era census population growth, it is undeniable that there were many Chittagonian immigrants in Arakan. You have expressed your concern about the size of population of Rohingya in Arakan. And also you said that the population growth rate of Rohingyas is higher than Rakhine, which makes Rakhines presume Rohingya will swallow them. You also exerted that, according to the British censuses, there ere many immigrants from Chittagong who settled down in Arakan. 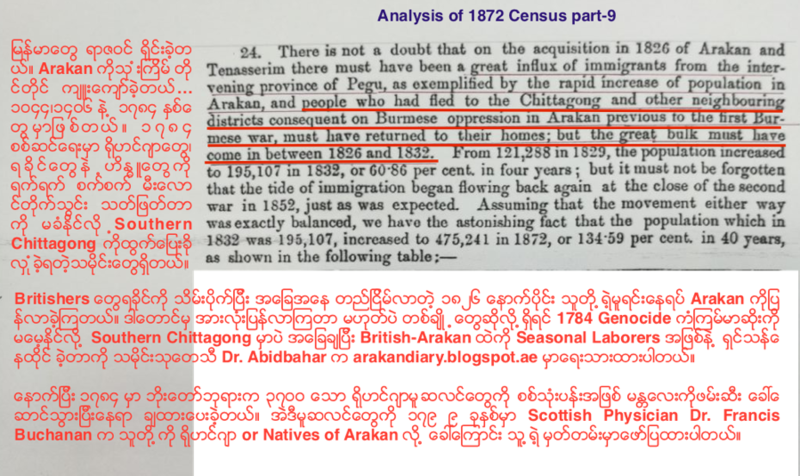 You also wrongly quoted that, according to 1872 census, the Rohingya (Mahomadens) population of Arakan was 58255, which was the total Rohingya population in Akyab district only. The actual Muslim (Rohingya) population according to 1872 census was 64000. Regarding population growth, an example is entertained. If any body is financially strong enough to live in furnished apartment in the downtown area, why will he go for wood-and-bamboo-made tent in outskirt area? Still the choice will be his. It’s his right. Just because a race has higher growth rate, it should not be eradicated by exerting various forms of torture. That must not be the ground that Rakhines will be marginalized by means of population. That chance of increasing growth rate is also with Rakhines. Why not followed by Rakhines, then? Rohingyas are not sole contractor of high population growth rate. Besides, there are no Rohingyas who got poor just because they have many children and also there are no Rakhines who got rich just because they have fewer children. Many Rohingyas do have no family planning. Give them the chance to liberate themselves from the current deadlock and the opportunities to learn, study and grow. They will plan it for themselves. If one sister community group is afraid of the other just because of relatively higher population growth rate, aren’t we be feeling that we are dragging back ourselves to stone ages, though we are IT ages in. Just see the neighboring country Bangladesh, the population of which is estimated at 163 million (2016), where about 86% of Bangladeshis are Muslims, followed by Hindus (12%), Buddhists (1%) and Christians (0.5%) and others (0.5%). 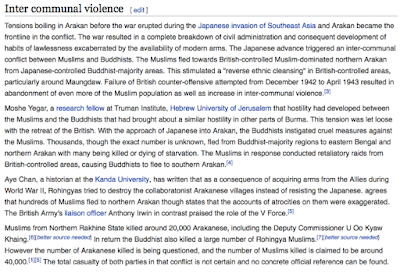 The 86% Muslims embraced 1% Buddhists and 12% Hindus, and ensured all their rights, and living peacefully since long. But in Myanmar with total population 51419420, what word to use, if about 90% of Buddhists are presumably to fear the 4.3% Muslims in the name of islamophobia? If over-populated Bangladesh wants to Islamize Myanmar, why then they not forcibly convert or drive out 12% of Hindus and 1% of Buddhists from the soils of Bangladesh first? 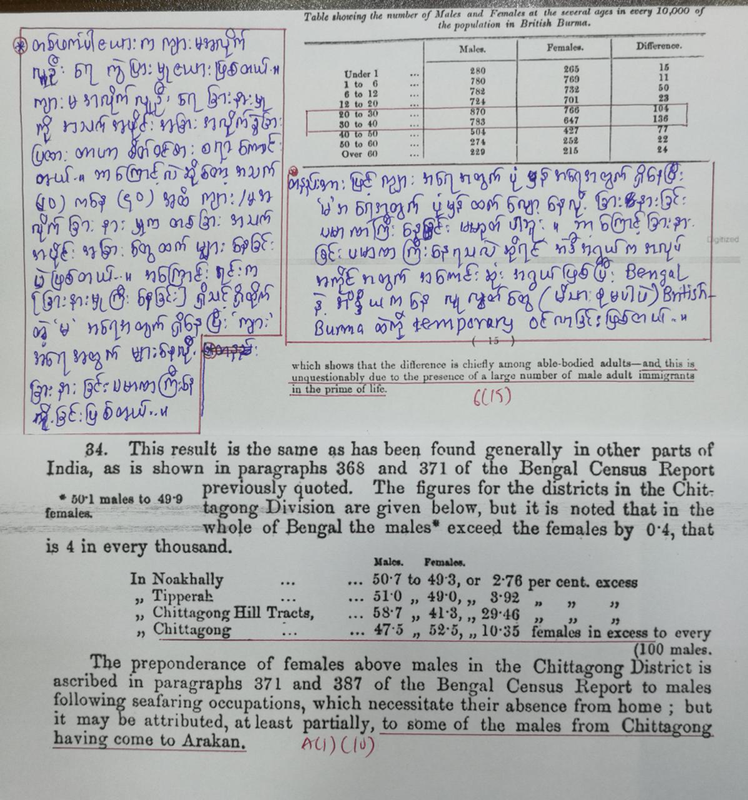 There were seasonal immigrants to Arakan from Chittagong, Madras and other parts of India but the Chittagonian returned home after seasonal work, having earned pocketful of money, and the Indians used to return their home after saving some money during the stay in British Burma from one to four years. 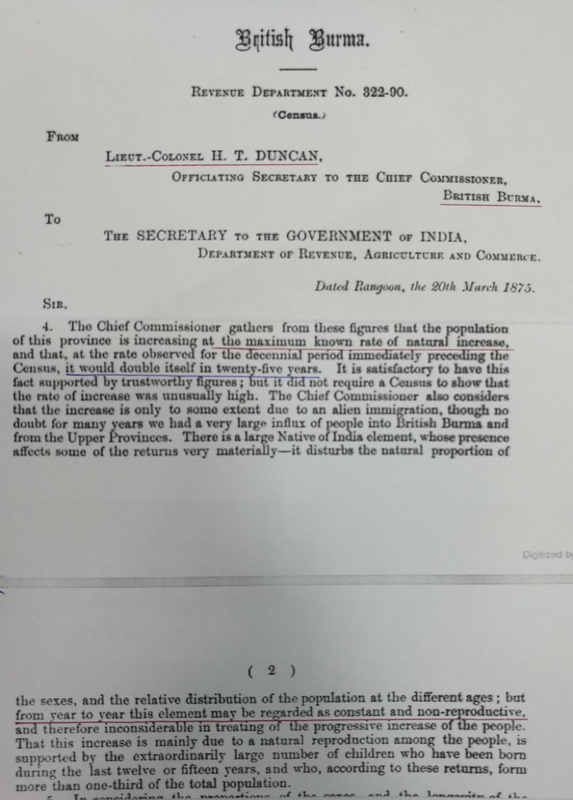 Further more, in the census report of 1872, it was mention that the population of British Burma is increasing at maximum known rate of natural increase (Screenshot-2). The report also pointed out that there were numbers of Indian elements that year to year remained constant and non-reproductive. The report also well documented that from 1862 to1871 the increase rate was 2.68%, which is normal. Remarkably, in the year 1872 the increase rate was 7.21% for which the report claimed that there were no exceptional increase but put that the accuracy of enumeration, closer counting and high reproduction rate among the inhabitants, were the reasons behind the increase (Screenshot-3). Therefore, population growth rate increase cannot make Rohingyas the Chittagonian Bengali immigrants. Another interesting points to be noted from 1872 census reports are; that (1) the adult male population size in British-Burma was greater than the size of female population, that is there were extra more male than female in British Burma, confirming that the Chittagonian laborers did not bring their families with them and went back after season expired and, (2) in the same year 1872, according to the Bengal census, in Chittagong there were fewer male than female, confirming that some of the adult males have gone to British Arakan for seasonal work leaving behind their families at Chittagong (Screenshot-4). Therefore, it is on the part of Myanmar government to sincerely focus on historical facts to solve long entangling Rohingya problem. History is not to read and feel with emotional feelings. If we interpret the history as we feel it, the sufferer will be not only Rohingya but also Rakhines and other countrymen. Now look at the tract map displayed. Red marked were Bengalis separate villages, Yellow, mixed Bengalis and Rakhine villages and, Blue, Arakanese and other villages, Dark Orange, NaTaLa villages and, Green, 2012 conflict-affected torched villages. The ways of existence of the villages make feel Rakhines and other ethnics that they are being circled by Bengalis. From that, it can be understood that it is anxiety-causing factor for them. In 1990s, it was the Military government who initiated the settlement of NaTaLa Villages in between Rohingya villages in northern Rakhine State on the confiscated lands of Rohingyas. Those Rakhine villages were built on Rohingyas sweat and money. The new settlers were partly from Yangon, who were homeless and lawless, and partly from Bangladesh, who are Bengali Buddhists. Rohingyas had forcefully to surrender their forefathers owned farmlands to Rakhines. The government induced the hatred and hostile policies in NaTaLa villagers and from that on Rohingyas have been living life in extra high tension. As the settlers grew, crimes and atrocities towards Rohingyas both by Rakhines and security forces also grew. They looted Rohingyas belongings whenever and wherever possible. The most distinct affect was that the area has been populated with various kinds of gambling and liquor houses making the atmosphere very hostile and causing moral corruptions and degradations. It is baseless and illogical to say that fear is rooted in Rakhines because they feel their villages were surrounded by Rohingya villages. It is government that created that atmosphere by discriminating Rohingyas and degrading their citizenship standard. We are human. We are not living life in the forest like animals. Even animals can live peacefully in the forest, we, being humankind, why cannot we? 1. Uprising in Arakan state. In 1942, withdrawing British from Arakan armed Bengalis to form the BGF. However, instead of fighting Japan, began to push against Rakhines. There were different sayings about how many Rakhines were killed. But after the war in a British report, in Buthidaung and Maungdaw regions 204 Arakanese villages were destroyed and only in 60 villages Rakhines were to resettle. So until today one can still find Bengali villages in Rakhine names. More importantly, 1942 events have a profound effect on Bengalis by Rakhines. 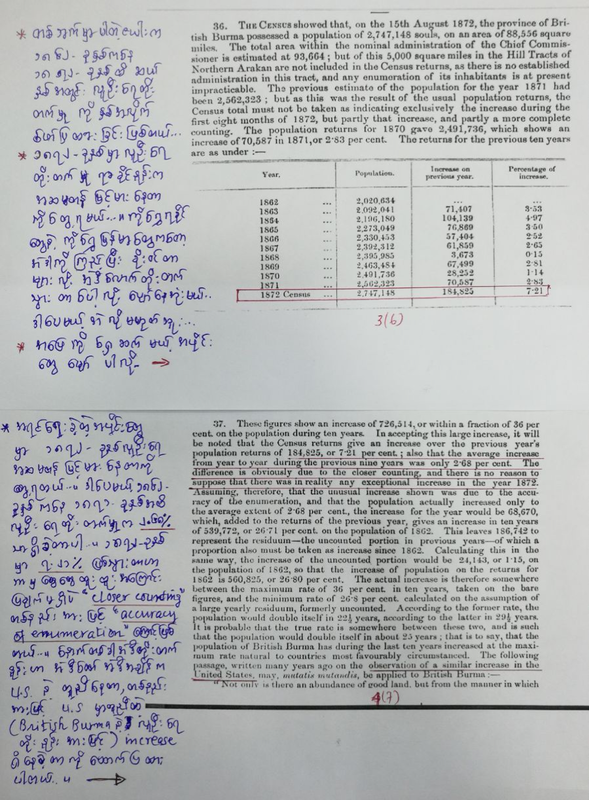 When in 2012, Rakhine state inquiry commission interviewed 1200 Arakanese, they all answered that they've heard about 1942 conflict from their parents. Well, dear U Ye Htut! As pointed out earlier, history is not emotional version records of the ages. If we one-sidedly emphasize the part of history, then we will never be able to have correct results to help solve problems. 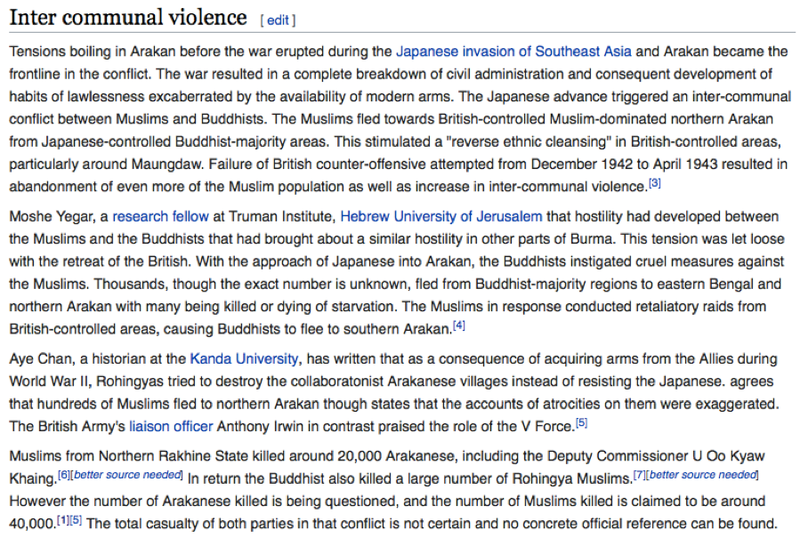 According to the Wikipedia.org, in 1942 massacre of Arakan both Rohingyas and Arakanese Buddhists were perpetrators targeting Rohingya Muslims in Japanese-controlled southern part of Arakan by armed Arakanese Buddhists, and Arakanese Buddhists in northern Arakan by British loyalists local Rohingyas. 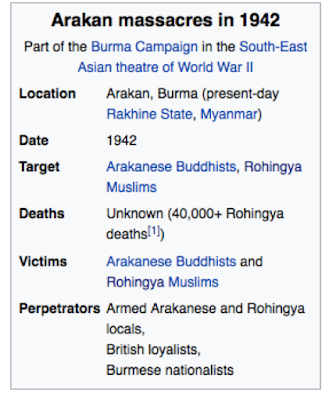 So, the casualties from both sides were remarkable and in one place Wikipedia.org recorded that “Muslims from Northern Rakhine State killed around 20,000 Arakanese, including the Deputy Commissioner U Oo Kyaw Khaing. In return the Buddhist also killed a large number of Rohingya Muslims. However the number of Arakanese killed is being questioned, and the number of Muslims killed is claimed to be around 40,000. The total casualty of both parties in that conflict is not certain and no concrete official reference can be found.” More than 300 villages of Rohingyas (you said 204 villages of Rakhines were destroyed) were destroyed and 62,000 had fled to Bengal, part of British India (Screenshot-5 and 6). Therefore, if you only talk about the sufferings of Rakhines, would you feel safe in your inner mind-set? Their elders also told Rohingyas how they suffered in 1942 massacre, as you mentioned that, when Rakhine commission in 2012 interviewed 1200 Rakhines. These are emotional feelings and perception. It is the government who is responsible to mediate between the two communities. Instead, the government is very much concern about Rakhines’ emotional feelings that are against Rohingyas and when their feelings are against government, it pass the problems to Rohingyas by creating anti-Muslim propagandas. The sad is for Rakhine politicians and leaders who repeatedly fail to see that trap till now. And you mentioned that there are many Rohingya villages in Rakhine names. Please any one can explain me, which of these names are Rakhine or Burmese? Arakan (now Rakhine), Akyab (Sittwe),Cheinkharli (Ohntaw), Gorakhali (Kyaungtaung), Goduthara, Kanhpuu, Bagonenaa, Bolibazar (Kyeinchaung), Nurulla para (TetOoChaung), Inndin. These are only few from many. The reality was that the government purposely changed Rohingya named to Burmese names to misguide the world about the Rohingya history. 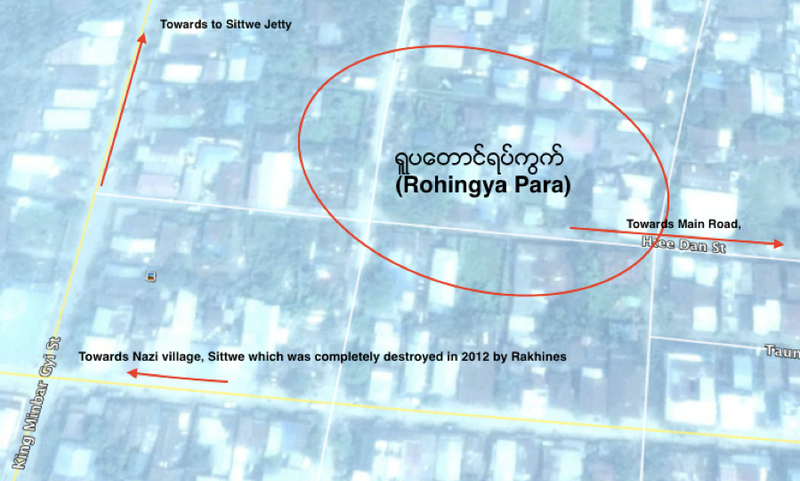 And you know there is Rohingya para in Sittwe, which is now called as Yupa Taung Ward (screenshot-7). And there were many official maps of Maungdaw, which use Bolibazar (Not Kyeinchaung). You argued about the Rakhines villages destroyed, but on the other side, you purposely remained silent about the Rohingya villages destroyed in southern and northern Rakhine. Will government allow resettling those Rohingya villages? Why one-sided? Who understand logic can decide who suffered most in 1942 massacre; Rohingyas or Rakhines? British supported Rohingya Muslims with arms in the absentia and Japanese forces supported Rakhines with their presence. 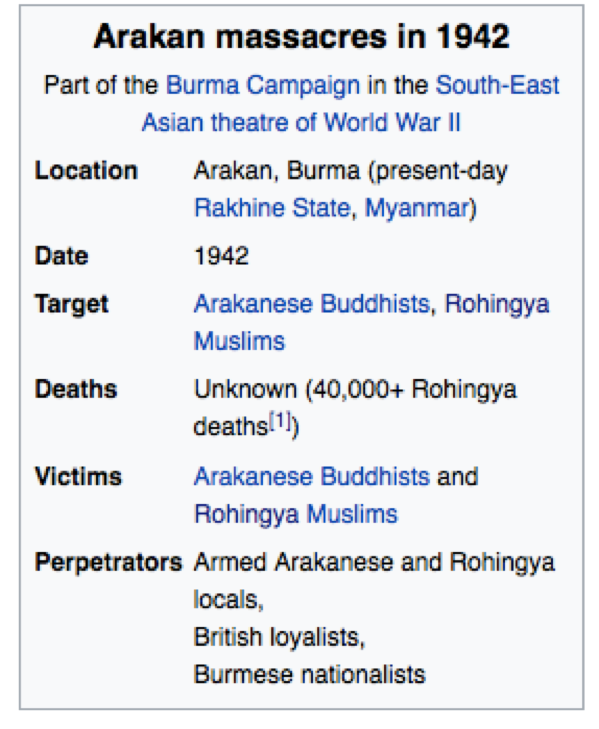 There were records from Wikipedia and Rohingyas who survive in those days witnessed how brutal the Japanese forces and Rakhines were towards Rohingyas. 2. 19 48-19 54 mujahidin rebels. In this period also Rakhines from Buthidaung Maungdaw had to flee again. 2. After independent of Burma, all ethnic groups, not only Rohingya, took rebellion against Burmese government for the autonomy. Why not arise concerns about how many of civilians fled due to the fights between Burmese forces and ethnic groups in other parts of Burma. Particularly pointing about the Rakhine state is fueling ongoing tension between the two communities. And Mujahids were the first to surrender the Government from amongst armed rebellion groups in Myanmar. Do you know how many Rohingyas had fled to Bangladesh due to atrocities committed by Burma Territorial Force (BTF)? After independent, Burmese authorities have launched more than 20 offensive operations again Rohingyas and every time Rohingyas are the ones who need to flee to safety. 3. 19 71 India-Pakistan war. During the war from the then East Pakistan (now Bangladesh) about half of a million refugees took refuge in Burma. Many of them returned after war. But, how much returned and how much remained was not known. At that time, the government of Myanmar was in war with China backed Bama Communist Party in the northeast region and could not pay attention to the western border. But Arakanese felt that they were neglected by the central government. 4. 1978 Operation King Dragon. In screening illegal entry from Bangladesh, more than two hundred thousand people had fled the area. They were accepted back on a situation where the two countries together verified. But the problem is out of the original list; the government of Myanmar had received about thirty thousand. These issues make Arakanese outraged and questioned on the government's repatriation procedures. 3,4. The Bangladesh government claimed 252,000 persons sought refuge in Bangladesh 1978 exodus and, after negotiation, the operation commenced on 31st August 1978 and ended on 29th December 1979 and involved repatriation of a total of 187,250 refugees from 252,000 to Arakan (burmalibrary.org). In actual number, more than 64,750 remained in Bangladesh due to fear of persecution by Burmese security forces and local Rakhine mobs. 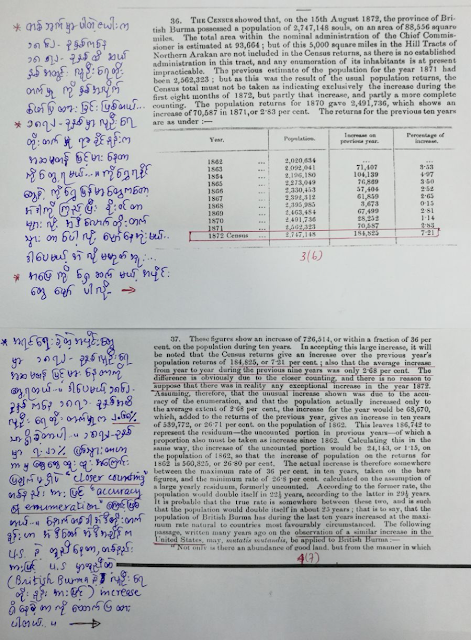 But U Ye Htut claimed that 30,000 extra had to be accepted back from 1978 exodus for which Rakhines were outburst against the government and questioned about the repatriation procedures. You said that 500,000 refugees took shelter in Myanmar during 1971 Bangladesh Liberation war. Majority of them had returned after war. But no body knows that how many of them had returned, and how many of them remained. Hypothetically speaking, if Nagamin operation was to scrutinize illegal entry, those illegally remaining from 1971 refugee must have gone to Bangladesh, as they will not have any chance to prove Myanmar Nationality in 6 years time, then why would they come back again to Myanmar, seeing danger in the future? Assuming that they fled because of no legal documents as Myanmar residence and, according 1978 MoU, only lawful residents of Burma were repatriated, then why would they be accepted back? By the way, how many times and how much the government has showed care towards Rakhine (Any ethnic group) since independent? If the same has enjoyed by the ethnic groups, the why they still are embracing gun to fight Burmese government? 5. 1988 Maungdaw uprising. In 19 88 uprising, Bengali villages tried to occupy Maungdaw. However, police could control it. It is a white lie. Everybody knows that 88 uprising were against the government by the all people of Burma for the all people of Burma. It was not specific communal violent carried out by a specific ethnic group. And it was not the war between Rohingya and government but the revolution against the government from oppressed people of Burma. Still you want to stick Rohingyas name on it. What happened in northern Rakhine state were the destructions of village administrative offices and government establishments but not private properties belonged to any other ethnic groups.